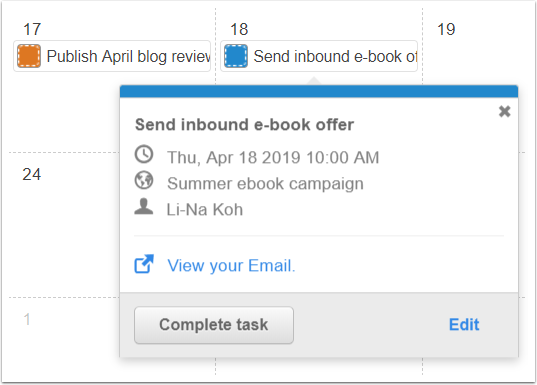 Use the calendar tool in HubSpot to assign content tasks to members of your team. In your HubSpot account, navigate to Marketing > Planning and Strategy > Calendar. 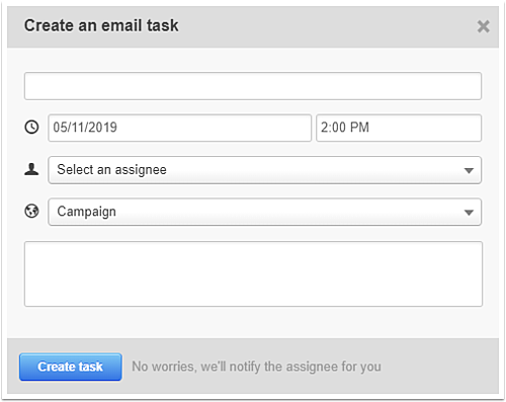 In the upper right, click Create task downCarat and select the specific type of content task to create, or select Custom to create a custom task. If you select Custom, Blog post, Email, or Landing page, a dialog box will appear. Enter a name for the content task. Set a date and time for the task. (Optional) Select the campaign to associate the task with. If the assignee has Assign notifications enabled, they'll be notified of the task assignment when it is created. To create an associated blog post, email, or landing page asset, select the Create [content type] checkbox and select the blog and topics (blog post) or template (email or landing page) for the asset. The content asset will be created when the task is created, and scheduled to be published or sent on the task date and time. If you select Social message, the social composer panel will slide in on the right. Proceed to create and schedule your social post. The task will appear on the calendar at the selected date and time. Click the name of the task. To open the content asset in a new browser tab, click externalLink View your [content name]. To mark the task as complete, click Complete task. To edit the task within the calendar, click Edit. The tasks and events that appear on the calendar depend on the user's Contacts Access permissions. For example, if you have the Owned only view and edit permissions sets, you won't be able to see or edit unassigned tasks, or tasks assigned to other users. 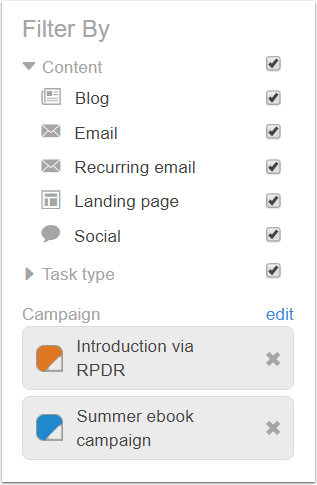 If you have the required Contact Access permissions but can't see certain tasks, ensure you have selected the correct content and campaign filters in the left sidebar menu. Please note: automated emails are only listed on the calendar once, not each time the automated email is sent via a workflow. To view automated emails on the calendar, select the Recurring email checkbox in the left sidebar menu.